At least 6.5 lakh AK-203 assault rifles will be made by the new joint venture at Amethi’s Korwa Ordnance Factory. They will replace the Army’s INSAS rifle. New Delhi: Prime Minister Narendra Modi Sunday inaugurated an Indo-Russian joint venture, under which AK-203 assault rifles will be manufactured at the Korwa Ordnance Factory in Uttar Pradesh’s Amethi district. The joint venture, called the Indo-Russia Rifles Private Limited, will be led by an Indian CEO from the Ordnance Factory Board (OFB). While the OFB will have a 50.5 per cent stake in the venture, Kalashnikov will have 42 per cent and Rosonboronexport will have 7.5 per cent. This is positive news for the Indian military, as the Russian rifle, chambered to fire 7.62×39 mm ammunition (same as the AK-47), is expected to meet the requirement for the 6.5 lakh assault rifles that the Indian Army is looking for. This is in addition to the rifles ordered from US manufacturer SIG Sauer in January this year. The new guns will replace the 5.56×45 mm INSAS (Indian Small Arms System) rifles, which have been in use for over two decades. The three Services are set to spend at least Rs 12,000 crore as they aim to equip their personnel with modern rifles and light machine guns. Incidentally, while every Indian soldier carries the INSAS rifle, the Army has a concept of sector stores, under which those operating in Jammu and Kashmir and the Northeast are given AK-47s instead of the INSAS. The acquisitions will see India become one of the few countries in the world to use all three calibres. Most countries have infantry rifles chambered to fire one of three popular rifle calibres to standardise inventories. The Rs 700 crore deal with US arms-maker SIG Sauer for the SIG716 is already in process. Under the fast-tracked deal, the Indian Army will get 72,400 SIG rifles, chambered for the 7.62×51 mm round. India also has an option clause of reordering 50 per cent of the guns at the same price. “There may be a repeat order once all the rifles are delivered,” a top source in the Indian Army said. The idea is to equip the frontline infantry soldiers with the SIG, while the rest would be equipped with the AK-203. The Indian Army is also closing in on a deal with UAE arms firm Caracal for its CAR 816 close-quarter carbine. The Army has plans to buy 96,000 CAR 816s, chambered for the 5.56×45 round — the same rounds used by the INSAS. With an effective range of 200 metres, the carbine will the third weapon in the Indian Army’s service. Incidentally, the OFB had also come out with a 7.62×51 mm rifle, which was rejected by the Indian Army after trials. “There was too much of recoil, high visibility of flash and sound, besides of course the weight and stoppages,” a source involved in the trial told ThePrint. 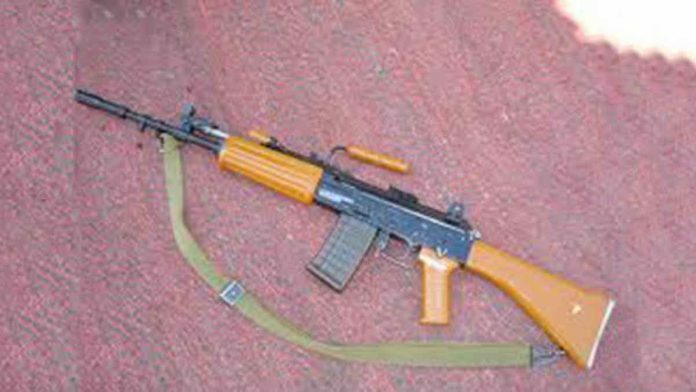 In the 1980s, the Indian Army sought a lighter assault rifle chambered to fire the 5.56×45 mm cartridge. It was meant to provide relief to the Indian soldiers who fought the Siachen battle and the LTTE in Sri Lanka with the 5.1 kg Ishapore 7.62×51 mm rifle, but since its introduction in 1998, the INSAS proved to be a constant burden. INSAS saw its first action at high altitudes in the 1999 Kargil battle, and even as the soldiers fought on, there were complaints of jamming, magazine cracking due to the cold, and the rifle going into automatic mode when it was set for three-round bursts. Adding to the long list of issues was that the fact that at times, the oil splashed into the soldier’s eyes while firing. The Nepal Army also got the INSAS, but following a deadly encounter with Maoists in 2005 in which 43 soldiers were killed, its spokesman called the rifle substandard and claimed that the operation would have been more efficient had they got better weapons. As expected, India rejected the claims. “The soldier is not confident about killing of an enemy when using the INSAS because it is of a lower calibre. There are too many stoppages, and moreover, it is not ergonomically well made,” a senior officer in the Infantry Directorate of the Indian Army told ThePrint. Another officer explained that the rifle was too long a weapon to be used quickly in war or in operations. The formal process to replace the INSAS rifle began over a decade ago, but never saw the light of the day. Among the many reasons was the fact that the Army changed specifications for the replacement two times. It first wanted a dual-calibre rifle which could shoot two types of cartridges — the AK-47 bullet and the INSAS bullet. It then scrapped the process and wanted a modified INSAS rifle.